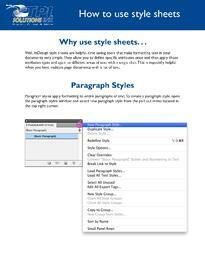 InDesign style sheets are helpful, time saving tools that make formatting text in your documents very simple. They allow you to define specific attributes once and then apply those attributes again and again to different areas of text with a single click. Download this guide to find out more.